Bloody exciting session of percussion-triggered computer music from Morton J. Olsen (snare/tape delay) and Rubén Patiño (laptop/mixer) aka N.M.O. (Navngitt Monster Opptog), well recommended to fans of Powell and EVOL! 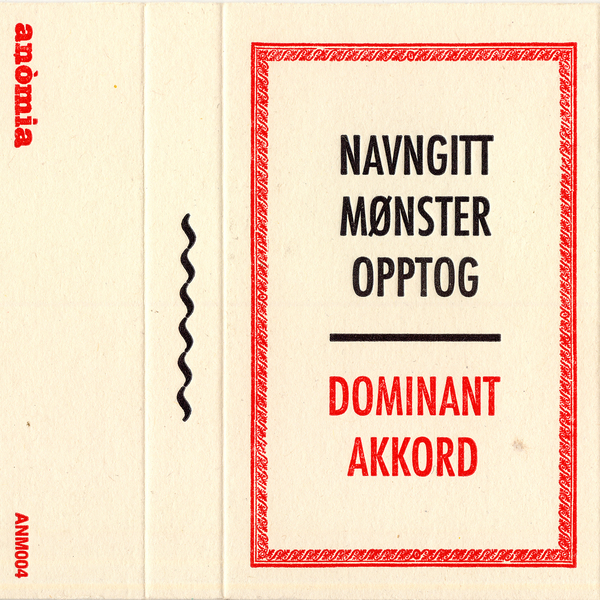 Released on the Anòmia label, who previously issued that excellent Xeerox LP and Mars rehearsal tapes, 'Dominant Akkord' is a canny manifestation of N.M.O's mostly (far as we can tell) improvised praxis blending effected snare drums and visceral computer sounds in a dynamic, para-dimensional mix of raw, rhythmic electro-acoustics with a ruffneck, freeform approach clearly harking back to the deconstructed No Wave rock of late '70s/early '80s New York but with a keenly contemporary edge and awareness. What are you waiting for? The future is here, tuck the f**k in!